Weight Loss After 40: Weight Loss Tips, Recipes, and Workouts! Weight loss after 40 isn’t the easiest feat to conquer. As women get older, our bodies change. Our metabolism slows down making it harder to shed unwanted weight. You could be burning 300 fewer calories a day than you did in your early 20s, which means you have to be more cautious about the food you put in your body and create a workout plan that sheds fat and also builds muscle. Losing weight over 40 is also more difficult due to falling estrogen levels in perimenopause and menopause. This dip in estrogen levels can cause insulin sensitivity, which can make your blood sugar levels more prone to spiking and crashing, making you crave high carb, sugary snacks. All of this combined is a recipe for unwelcome weight gain. But if you’re mindful about what you eat and the workouts you do, you can look and feel the best you have in a long time! Check out these weight loss tips, workouts and recipes to get in the best shape of your life! 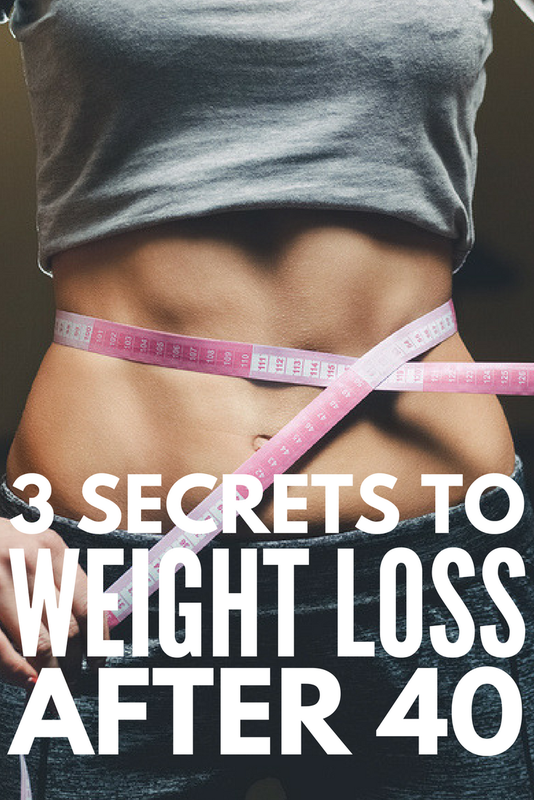 If you’re wondering how to lose weight in your 40s, here are 3 of the best weight loss tips to help you get to a healthy, happy weight! Cutting back on refined carbs has many health benefits, especially when it comes to weight loss. Refined carbs are foods like cookies, cakes, pastries, candies, fast foods, breaded or battered foods, sugary cereals, pastas, bagels, pizza, sugar-sweetened beverages, and the list goes on. Cut back on these foods as much as you can. Refined carbs are absorbed into the bloodstream quickly, causing spikes in blood sugar and insulin levels. Many of the foods are highly addictive, but the more you wean yourself off of them, the easier it is to stay away. Meal portions in North American are getting bigger and bigger, and if we’re not careful, our households are going to massively overeat. This is especially dangerous for women over 40 since your metabolism is slowing down and your body uses fewer calories to get through daily activities. Some of the best ways to avoid overeating? Consuming adequate fiber is a great way to manage your weight in your 40s. You should be eating at least 25 grams of fiber a day to reap the benefits. Fiber helps with your digestive health, disease prevention, weight control, and foods high in fiber help you feel full for longer. To increase your fiber, eat foods such as lentils, black beans, peas, broccoli, raspberries, pears and oatmeal. Here’s a sample workout plan featuring 3 key exercises every woman in her 40s should do every week! In your 40s, it’s especially important to do cardiovascular workouts to decrease your risk of heart disease. Cardiovascular workouts include everything from running and spinning to dancing and swimming, so choose your favorite(s) and get moving! To get the best workout, you should be giving around 80% of your maximum work effort for at least 30 minutes. Yoga not only has great strengthening benefits, it’s also beneficial for your mental health. As women reach 40 and beyond, there’s an increased risk of depression, as well as anxiety, stress, and mood swings. Yoga can help ward off all of the above, plus it can help you get your weight back on track. While many women believe cardio is the best and only thing she should do to lose weight, strength training is also important for optimal health and a lean body. Strength training, such as bodyweight exercises, is one of the best things you can do to lose weight in your 40s. Along with weight loss it will increase your muscle mass, increase your metabolism, give you more energy and improve your quality of sleep. Plus, you can do strength training from the comfort of your living room! If you’re new to strength training, below are 2 strength training workouts for beginners! Here’s a weekly sample meal plan you should stick to if you really want to know how to lose weight over 40! Are you looking to lose weight over 40? Try these weight loss tips, recipes and workouts to feel and look your best! If you loved these tips, workouts and recipes for weight loss after 40, please share this post on Pinterest!